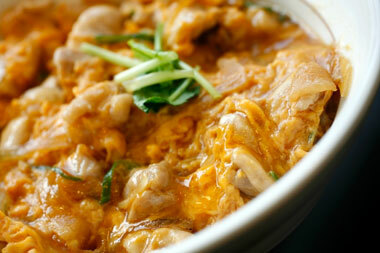 Oyako means parent and child in reference to the fact that this dish’s main ingredients are both chicken and eggs. This very traditional Donburi or bowl with rice and topings can be found in almost any noodle shop in Japan. It is comfort food at its best and a much easier dish to prepare when you don’t have time to make something like Katsudon. When choosing the cut of chicken for this dish, go for thigh and leg meat. Did you know that in Japan breast meat is sold much cheaper than thigh meat? The flavour in the thigh is far superior to the often dry and tasteless breast which is better reserved for other types of cooking. Are you ready? Lets cook. Begin by evenly dividing the rice into 4 donburi bowls. If you don’t have any specifically for donburi, substitute smaller Chinese bowls. Larger than a rice bowl but smaller than a soup bowl. Mix the salt, dashi, shoyu, mirin and pour 1/4 of the mixture into a small shallow pan. Cook a quarter of the chicken and onion in the pan you just poured the stock until done. Pour a quarter of the lightly beaten egg in a thin stream on top of the chicken. Add mitsuba or green onion and cover the pan, allowing it to simmer until the egg is almost set but not completely cooked. Gently slide the chicken and egg on top of the rice in the bowl. Repeat the same process for the other three servings. If you don’t have company coming, you can be lazy and make it in one larger pan and then divide that among the four bowls. It’s up to you. Enjoy!